At the entrance of Golden Lotus Restaurant in Boulder, Colorado, Vicki Chen, a devoted student of Lama Zopa Rinpoche, has arranged a special table full of tsa-tsa images of buddhas, stupas and offering bowls, giving customers a chance to purify and accumulate merit on their way to enjoying a good meal. Proof and inspiration to all of us that holy objects can be built anywhere, Vicki’s idea is, of course, pure Rinpoche. 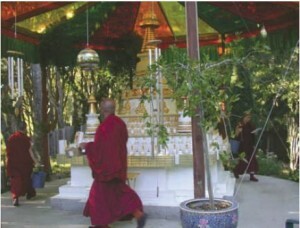 Over the years, Rinpoche has initiated the construction of numerous stupas, prayer wheels and other holy objects, large and small, around the world. Rinpoche also oversees the translation of texts dealing with their construction and related practices.